Summer has gone by so fast! I hooped less than I’d like, as I spent a lot of time battling my horrid allergies this summer, but still made it out to some Friday Night Live events, hosted a number of hoop jams and even hooped on the beach in Panama City. But now it’s time to get back to class, not only for the kids, but for us hoopers too! My adult hoopdance classes start soon at the Herndon Community Center, 814 Ferndale Ave., Herndon, VA 20170. Classes will be held Sundays from 11 a.m. to noon beginning Sept. 13 and Thursdays from 6:45-7:45 p.m. beginning Sept. 17. Each session is 12 classes and runs through mid-December. Classes run $74 for Town of Herndon residents and $99 for non-residents. For full details, signup information and more, click the links below. In the meantime, I’ll leave you with some photos and videos from this summer! 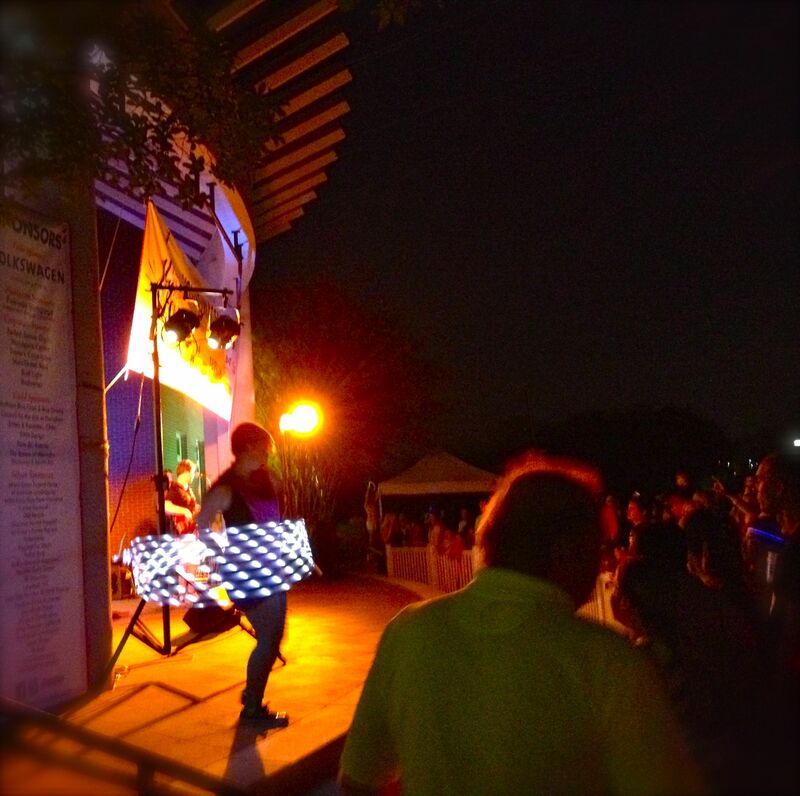 Hoopdancing to The Reflex at Friday Night Live in downtown Herndon in August 2015. Photo by Gary Corpuz. Hooping at the 2015 Jimmy’s Gold Tournament supporting the Herndon Council for the Arts. Photo by Herndon Mayor Lisa Merkel . New hoops on the quilt at one of our summer hoop and flow jams in downtown Herndon in August 2015. Hey everyone! I’ve been meaning to share my fall hooping playlist with you all and let you know what I’ve been listening to. Mostly because a lot of my fall students had asked. Some of it is fairly old and was released in late 2012 or early 2013. Enjoy and let me know what you’re listening to. Any recommendations? 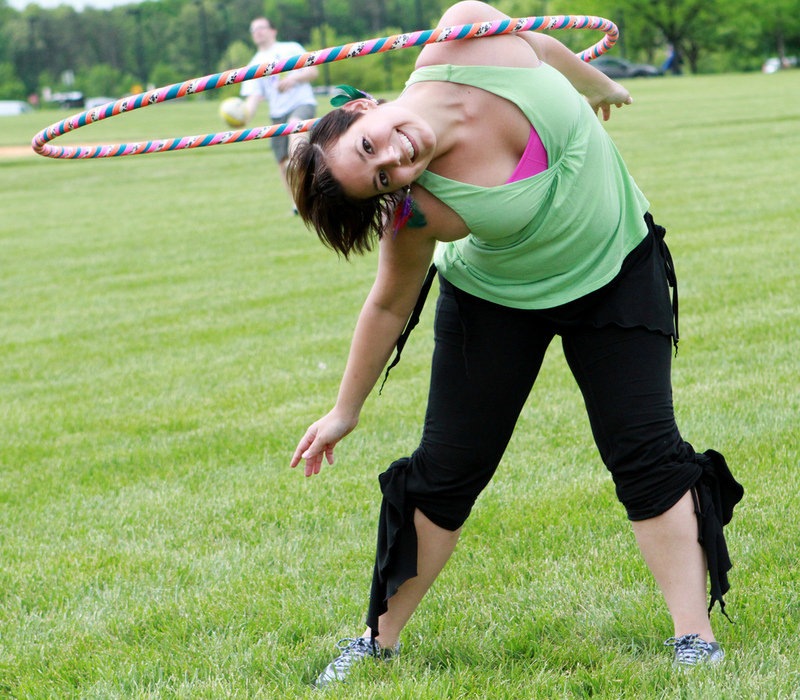 Looking to get healthy, get into a new activity with hooping or strengthen your skills? New adult hoopdance classes start in January! Classes are mixed-level and good for anyone from beginner to intermediate. Here’s the important info! A new session of classes begins either Sunday, Jan. 5 at 2 p.m. or Thursday, Jan. 9 at 6:45 p.m. at Herndon Community Center, signup for whichever day is best for you! This will be a mixed level class and good for those looking to further their skills, start fresh from beginner or just want to commit to regular practice and are looking to spend time with more local hoopers. The set of eight one-hour classes are $47 for town of Herndon residents and $62 for non-Herndon residents. There is no drop-in availability unless previously arranged with the instructor. Using the hoop on the waist, legs, arms, hands, hips and more burns between 400-600 calories an hour, and provides a great full-body workout while encouraging creative movement and expression. Hoops are always provided in class, but you can bring your own adult-sized hoop or purchase one from the instructor if you’d like to have your own to be able to practice at home. This week marked my second hoopiversary — or the second anniversary of when I started hooping. I discovered hooping on Valentine’s Day in 2011 when I stumbled upon this video of a girl in a green hoop, and I ordered my first hoops that day. On the 19th my hoops came in the mail and I started this crazy journey, in which I’ve pretty much not been able to put them down since. Now I’m continuing to spin in circles as I spread joy through hula hoops and dance. Looking for local adult hoopdance classes and jams in the Herndon and/or Northern Virginia area? Visit my Meetup at http://www.meetup.com/novaspinners. Want classes at your gym or community center? Email me at leslie at tillywhirls dot com. New Adult Hoopdance Classes in Herndon! Calling All Hoop Lovers! Hey everyone! It’s been such a long, long time. I’m sorry for my prolonged absence. 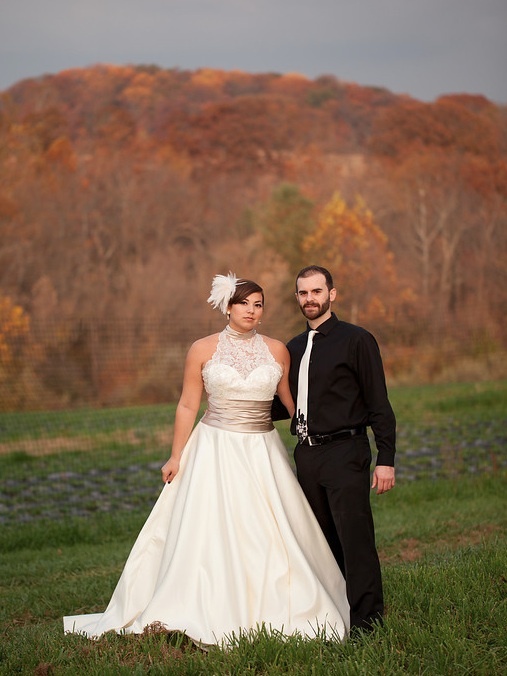 It was mostly because I went and got married in October and decided to take a few weeks off from extracurricular activities to spend some time with my new husband. My new name is Leslie Loges. Kind of exciting. 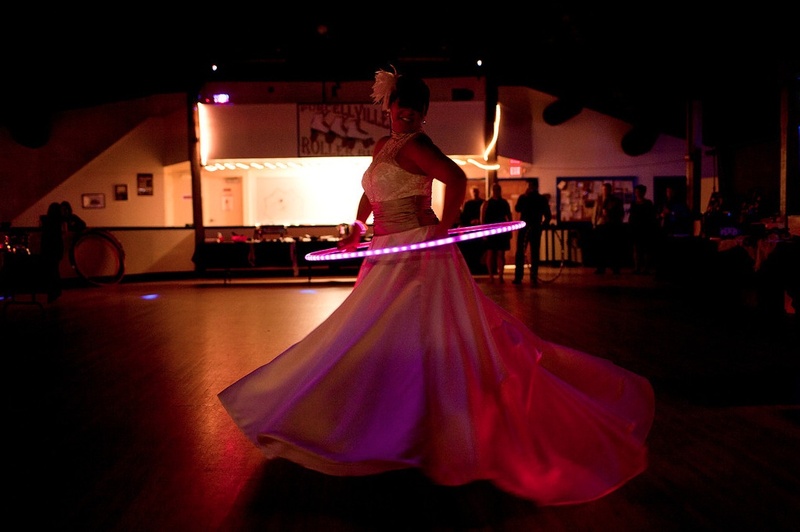 I’m here to announce NEW HOOPDANCE CLASSES! 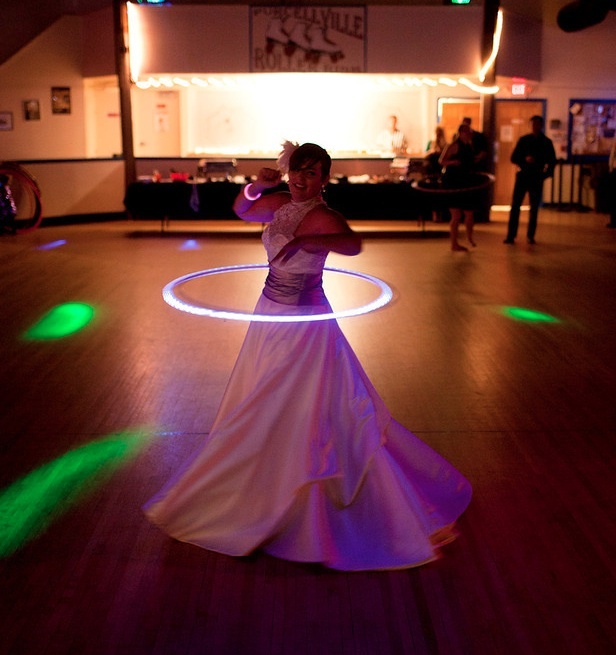 I’ll have two adult hoopdance sessions at the Herndon Community Center this January. I’ll have classes starting Sunday, Jan. 6 at 2 p.m. and classes starting Thursday, Jan. 10 at 6:45 p.m. The sessions are eight weeks long and cost roughly $47-$62 depending on whether or not you’re a Town of Herndon resident. Using the hoop on the waist, legs, arms, hands, hips and more burns between 400- 600 calories an hour, and provides a great full-body workout while encouraging creative movement and expression. Provide your own adult-sized hoop or purchase one from the instructor. There are eight one-hour sessions. Town of Herndon residents pay $47 and non-residents pay $62. • January 6-February 24, Sundays 2-3 p.m.
• January 10-February 23, Thursdays 6:45 p.m. This will be a mixed level class and good for those looking to further their skills, start fresh from beginner or just want to commit to regular practice and are looking to spend time with more local hoopers. I can’t tell you all how much I miss teaching. My students help refresh me and leave me feeling inspired and energized. I can’t wait to get back in the hoop with you, or meet you in the hoop for the first time! I’ll start working on some new playlists for you in the meantime. And until next time kids, I’ll leave you with a wedding photo or two. Or more. All amazingly wonderful photos by The Happy Couple Photography. New Kids Hoop and Adult Hoopdance Classes in Herndon, VA! Hello folks! It’s been a while again, and there’s much to say, but I wanted to start with my upcoming classes! 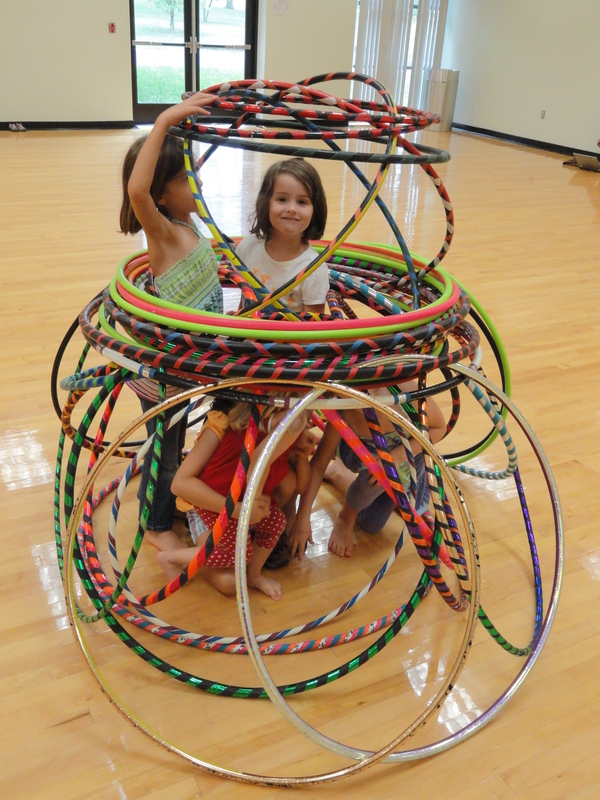 This summer I’ll have three hula hooping and hoopdance classes through the Herndon Community Center in lovely Herndon, VA. Two adult classes and one hoop class for kids! 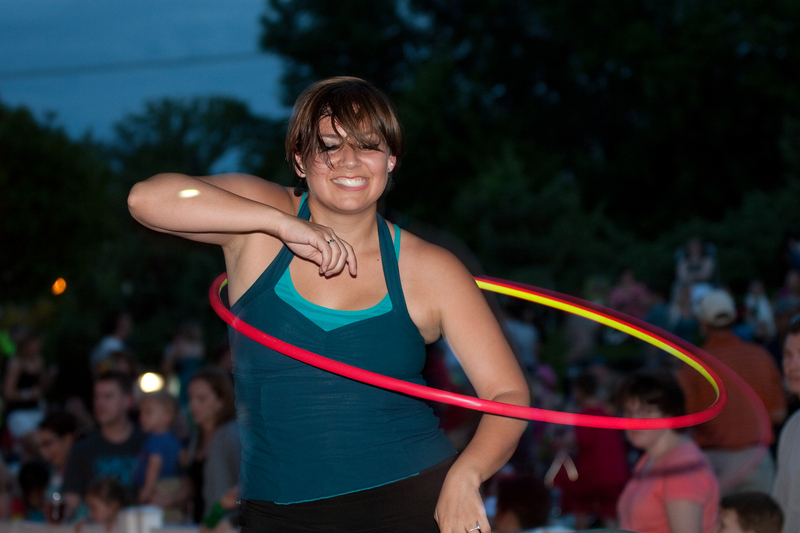 Tilly Whirls, Leslie Perales, hoop dancing at her regular weekly gig, Friday Night Live, in downtown Herndon in May 2012. 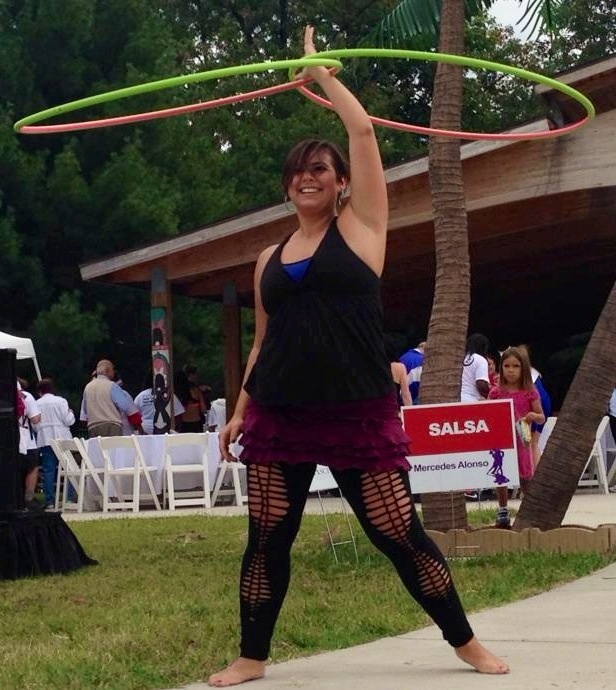 You can catch the Hoopnotica certified instructor hooping on stage most weeks at FNL. 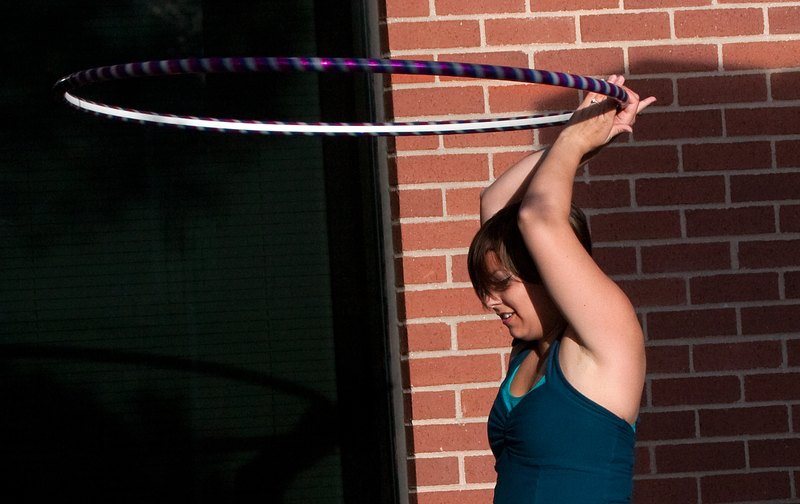 If you’re a beginner, come learn the basics of hoopdance, starting with waist hooping. If you want to expand on your hooping, hone the skills you have or get together to practice and work with other hoopers nearby you’re welcome too! The class starts with a bit of a warm up, we work on a few new moves and spend the rest of the class practicing and jamming out. Hooping is a great way to learn a new skill, burn 400-600 calories an hour, build self confidence and creatively express yourself. Hoops are provided in class but hoopers are encouraged to have their own so they may practice at home. Thursday and Sunday adult classes include eight one-hour sessions. Thursday classes begin June 28 and run through August 16 from 6:45-7:45 p.m. Thursday nights at Bruin Park. Sunday classes begin July 1 and run through August 19 from 2-3 p.m. Sunday afternoons at Herndon Community Center (the brochure that says its at Bruin Park is incorrect—that’s the Thursday night class only). This class is for ages 13 and older. You MUST sign up for the entire session, there is no drop in availability because it is operated through the Herndon Community Center. Town of Herndon residents pay $47, non-residents pay $62. 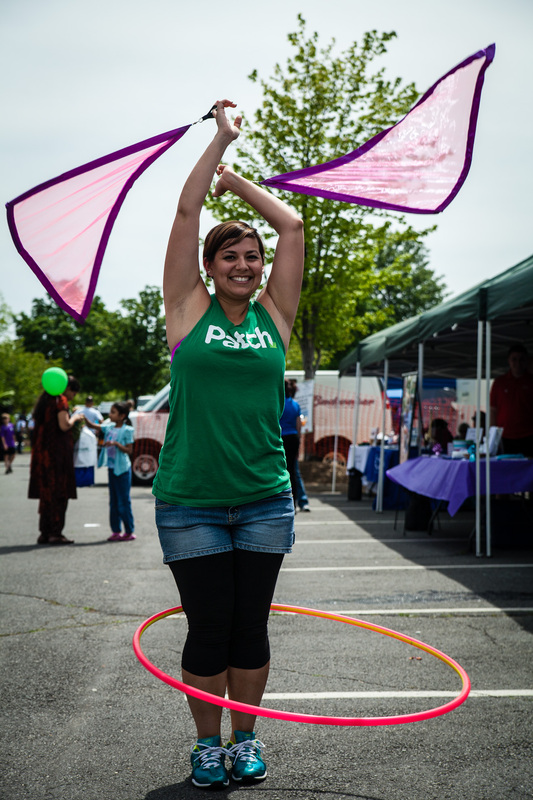 Hooping for kids will include many of the basic, foundational moves of hoopdance, along with games, creativity and more hoop fun. Children can bring their own hoops from home, use one of the instructors, or hoops can be purchased from the instructor. The class is eight one-hour sessions starting July 1 and runs through August 19 from 1-2 p.m. Sunday afternoons at Herndon Community Center. This class is for ages 5-12. You MUST sign up for the entire session, there is no drop in availability because it is operated through the Herndon Community Center. Town of Herndon residents pay $47, non-residents pay $62. IMPORTANT: Registration for all classes is through the Town of Herndon. Sign up by clicking the link below. Here’s the activity numbers to search for. 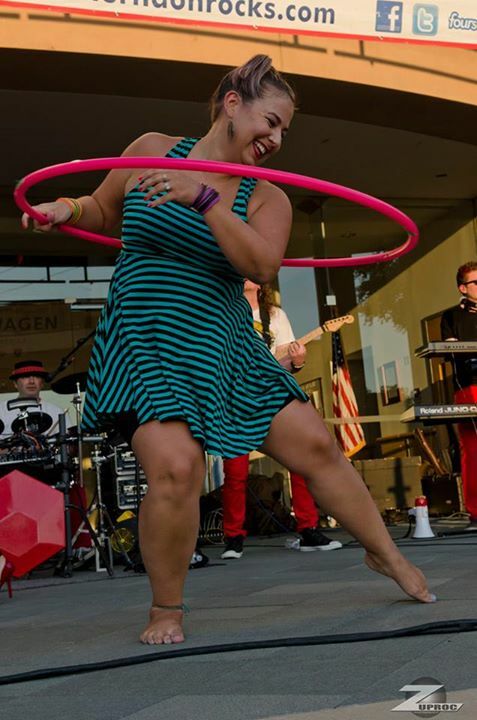 Tilly Whirls, Leslie Perales, teaches mixed-level hooping classes at the Herndon Community Center in Herndon, VA. This summer she’ll have a Thursday evening class, Sunday afternoon class and a brand new Sunday afternoon kids class. Classes are eight weeks long, one hour each week. Leslie brings hoops to class. The NoVA Spinners summer hoop jams are going strong so far. Many Sundays you can find us in Trailside Park in Herndon spinning it up in the grass near the skate park. We’ve got music, sunshine, some shade and hoops! Bring your own hoops or borrow one. Make sure to bring water—it’s getting hot these days. I usually bring some bug spray, sunscreen and hand sanitizer along with me to share. We often hang out, dance and spin together and share some skills, though it isn’t a formal class. For more information on hoop jams and other area hoop events, visit the NoVA Spinners Meetup page here! 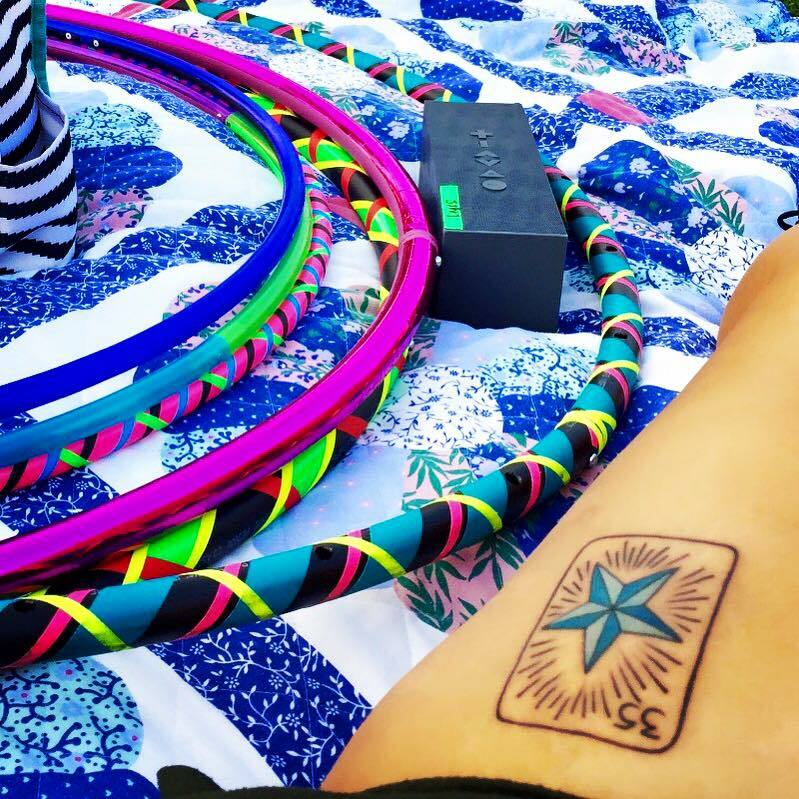 Tilly Whirls Travels to Hoop Convergence, Rocks Out at Friday Night Live, Performs at Herndon Festival and More! 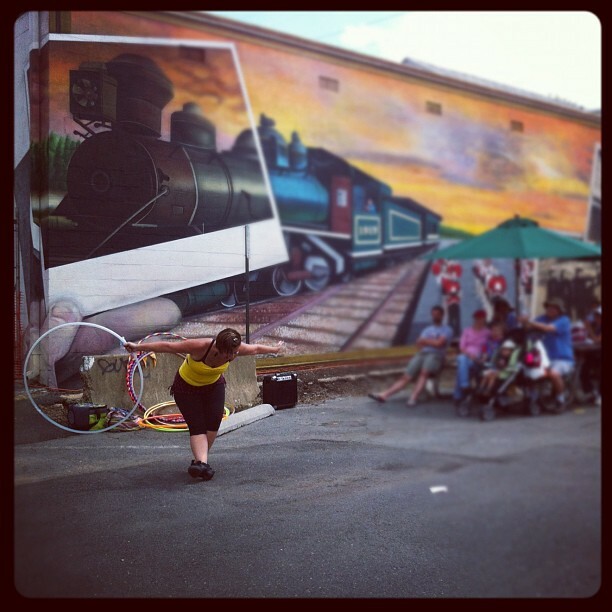 Tilly Whirls, Leslie Perales, hoop dancing at Friday Night Live on May 4, 2012. Leslie is a certified Hoopnotica hoopdance instructor, and is working on her BodyHoops Fit Kids hoopdance certification and will be certified as a HoopnoticaFit cardio hoopdance instructor in June 2012. 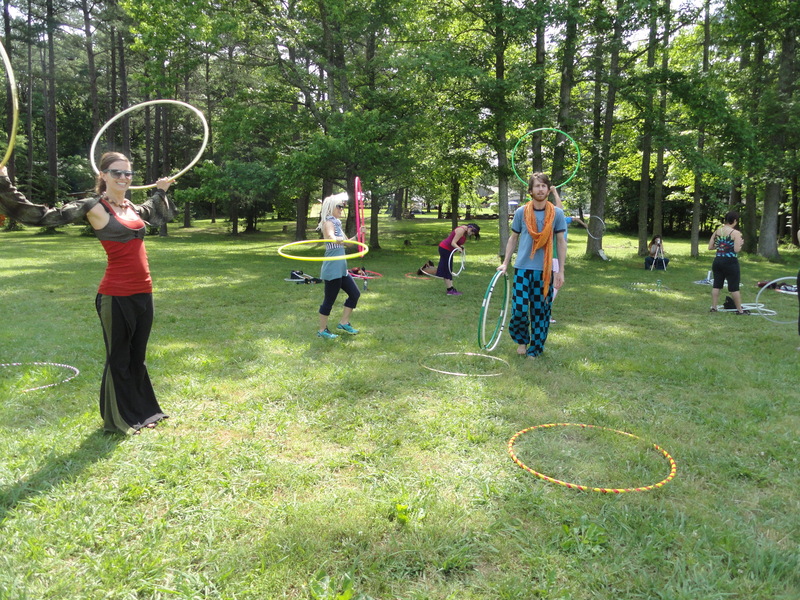 In May I also got to attend Hoop Convergence in the beautiful Carrboro, North Carolina where I got to take workshops with Bags, Kenna Hoops, SaFire, AlleyOop, Kandice of Holistic Hooping, and so many more wonderful folks who teach and perform around the world. It was a magical experience and I will definitely be going back for as long as this event is happening. Here’s a couple photos, including one of me fire hooping! The always beautiful and inspiring SaFire, Sandra Sommerville, on the left, and Steve Bags in his checker pants teaching Z-Spins. Such a fun class by the lake! 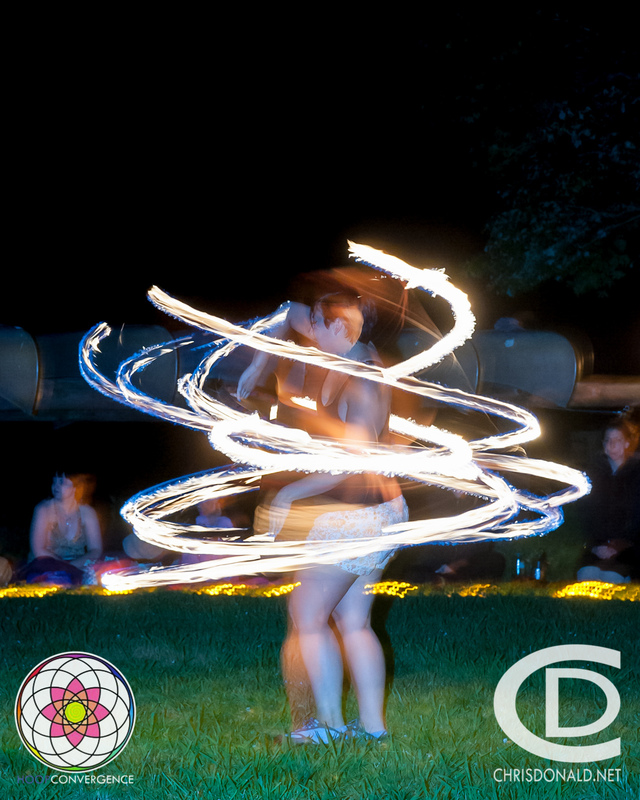 Tilly Whirls, Leslie Perales, first burn at Hoop Convergence 2012. A little addicted now, I’ll be working with some hoopers in West Virginia to do some training with fire. This spring has also included performances at Herndon Festival, AOL’s 5K and Chantilly Day! Don’t forget, Leslie does parties, performances and events. 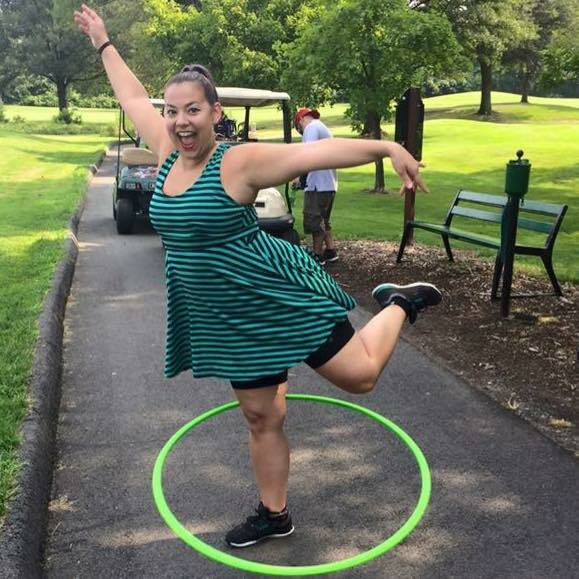 From Girl Scout gatherings to back yard block parties, Leslie can get everyone on their feet, twirling in a hoop and grinning. If you’d like to learn more about parties, performances and other ways to bring some more hoopyness into your life, click here. If you’ve decided you need your own beautifully taped custom hoop, click here. Next up I’ll be getting certified in Hoopnotica’s HoopnoticaFit program on June 23. It’s a cardio-based hoop class designed for all levels that’ll work you from head to toe. Look for classes to be offered in the late summer! Hoopers! Take part in the Hoop Injury Population Survey! Hoopers everywhere! This is important for us all! I’m helping out with a big study, known as Hoop Injury Population Survey, that Hooping Ted has undertaken to figure out how we can keep hoopers healthier longer. Since hooping is sort of an obscure hobby/activity, there isn’t a lot known about the types of injuries we get, or how to treat them. For example, hoopers may develop hoopers hip. But how much do we understand about that injury and how to treat it? Better yet, do we know how to prevent it? Questions like these are what the study aims to find out. To get an overview of the study, read the welcome letter from Hooping Ted below. Then join our group on Facebook to take part in the discussion and find ways to contribute to the study. I’m conducting the first, large scale, independent study on hooping injuries. The purpose of this group is to build support and community around the study. The hoop community is rapidly growing, but it’s still pretty new. As we keep pushing the boundaries of hoop dance, and more people decide to perform and teach hooping as a career, we’re seeing more chronic pain and injury. So many hoopers I’ve met have had pain or injuries, but don’t talk about them or hope they’ll magically go away. I believe most of these are preventable. In order to keep ourselves safe so we can hoop for many more years, we need to understand the nature of our injuries more deeply. What injuries are most common? Why are they happening? When are they happening? Who are they happening to? Only when we fully understand the problem can we create positive, lasting solutions. The study will be in the form of an online survey, launching May 1, 2012, and run through the end of August. The aim of the research is to explore pain and injuries in hoopers, and provide a better understanding of its causes, symptoms, and treatments. This study is not for profit. It is not directly affiliated with Return to Roots Hoop Gathering, and any R2R questions should be posted on that page. The data used in the study will come directly from the survey, not from this group. Please feel free to share your experiences though, it’s possible others have had a similar story and can offer some guidance. I’ll be posting updates on the study’s progress regularly on the group’s Facebook group. I spent the evening of my hoopiversary by myself spinning in my living room with some LEDs. It was wonderful to just bliss out and be thankful for all the hoop has given me. (Could I sound any more like a hippie?) For the full video of me playing on my hoopiversary clickie over here: http://www.youtube.com/watch?v=GP3duhGCGbA. I hated the song in that video until I saw it used in a hoop video. When applied to the right subject, turns out I love that song. Haha. • Feb. 26 was the day we adopted our Gordie dog. 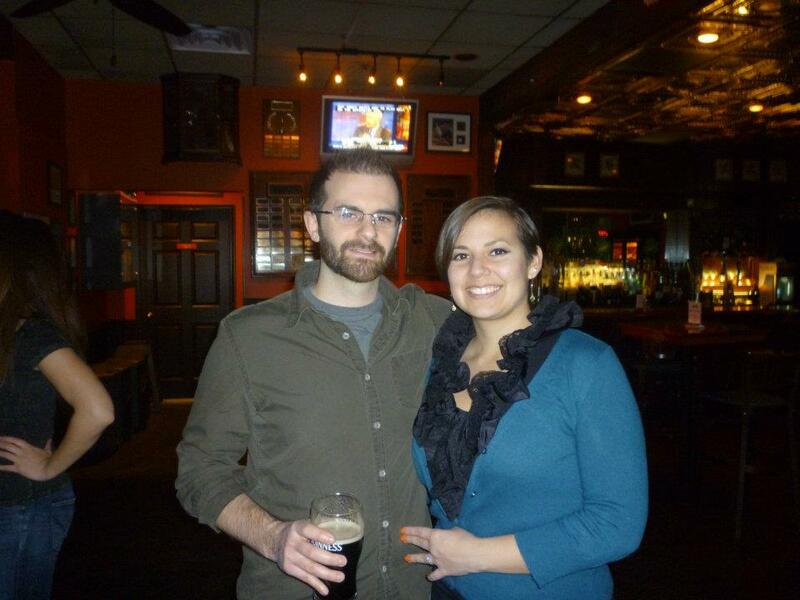 This is a recent photo of him. He’s pretty much my (our) child. We adopted him from Lucky Dog Animal Rescue when he was about 10 weeks old. His sweet face just captured my heart immediately. We’re the lucky ones, for all the joy, humor and love he brings to our lives. 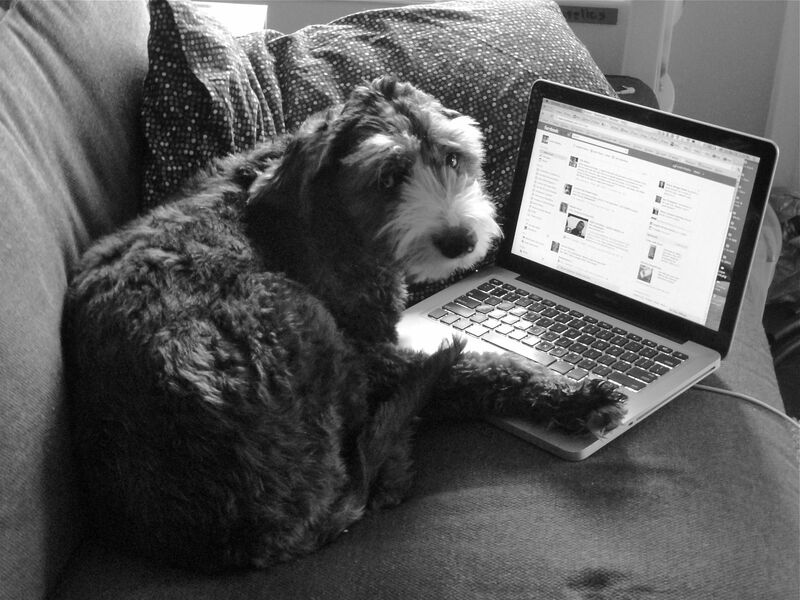 Gordie dog, 14 months old and already a Facebook addict. • March 10 was Steve and I’s anniversary of when we began dating. Eight year’s later we’re planning our wedding. Things are getting hectic and busy but we’ve called in reinforcements and are trucking along in planning. Photo by our lovely friend Danielle. • And today marks the one-year anniversary of my car accident. I was hit by a drunk driver. I was the designated driver for my friends. Dude ran a red light. Smashed into me and fled. The police caught him later. My friend Lauren listened to the police scanner traffic from the night before to listen to my accident. I never could bring myself to do it. They called out the helicopter for me though! Haha. Luckily I walked away mostly unscaled, save for my right shoulder. I still have lingering pain and issues with it sometimes. I use my accident as a reminder to tell people not to drink and drive. Have a designated driver. Have a plan. Call a cab. Watch out for your friends and loved ones. Take care of each other. If my words don’t emphasize the importance of not drinking and driving enough, perhaps a picture of my car will. Don't drink and drive, folks! Fer serious! 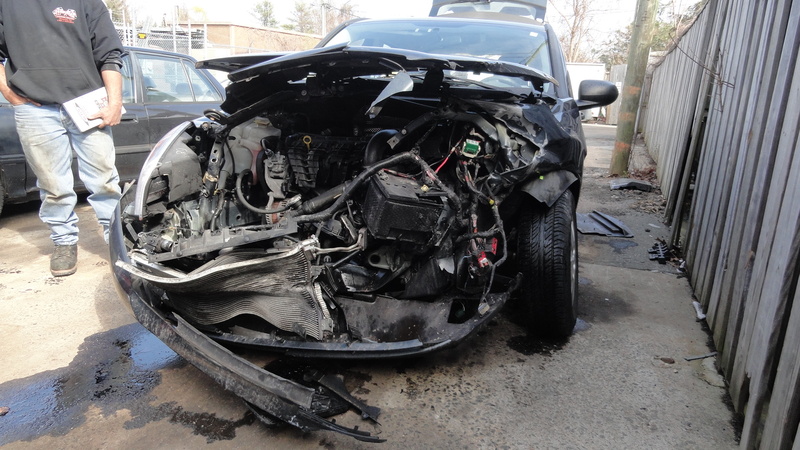 This was my car. WAS. So I promise that I’ll write more and then I disappear again. Sorry about that. I have something I want to share that I’m really proud of though. It’s a video of my practice tonight. I’m really pleased with where I’m going in my personal hooping practice. I’m about halfway into my second session of hoopdance lessons at the Herndon Community Center and absolutely love it. My class is small this time, but it gives me more time with everyone individually and everyone is doing so well. It makes me so happy when I see them progress. The smile on their face when they realize they just got a trick for the first time is priceless. I’ve signed up to go to Hoop Convergence in May. I’m thrilled! So far Caroleena, Spiral, Brecken, Nick G and many other hoopers I love are on the list of instructors coming to present. It’s going to be an amazing five days in the hoop.